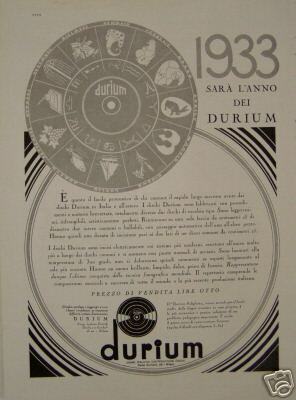 Thanks to Jerry Priessen I received this 1933 durium leaflet to promote the "new" Italian durium label. Thanks to Jerry Priessen from Amsterdam ( The Netherlands) I got a bunch of pre war Italian Durium records. I had never felt, smelled or tasted one, so it is good to have it around. Thanks Jerry for your help. This is one of the items. The music, played by the Grande Orchestra di Valzer, is pure classical music. There are a few things to say about the record that I find remarkable. First about the paper used. Normally Durium records are made of light brown cardboard covered with a surface of dark brown Durium acetate. This Italian one is made of black cardboard, thinner then the ordinary Durium cardboard and the Durium surface is black. Other Durium cardboard records, with the same DVRIVM "LA VOCE DELL'IMPERO" label have the ordinary light brown cardboard layer, also DVRIVM "LA VOCE DELL' IMPERO" T-163 has the normal light brown layer. The DVRIVM "LA VOCE DELL'IMPERO" T 164 has a sub-matrix number 36 A, a series of matrices also used in other, non Italian durium records. This series of sub-numbers need some research. This record seems to have been recorded ca. 1936.